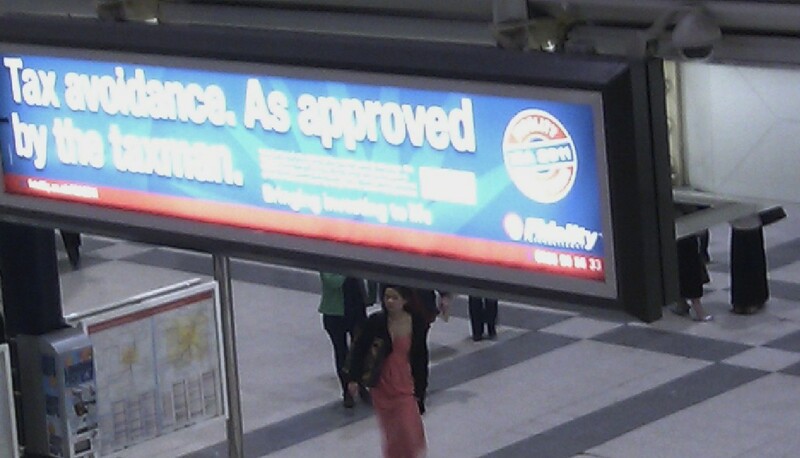 It's hard to beat the sheer stupidity of this advert spotted at Liverpool Street Station. Issued by fund managers Fidelity International it reads "Tax Avoidance. As approved by the Taxman." This is a reference to ISAs (Individual Savings Accounts), the income of which is tax exempt, i.e. the British government charges no tax on the income as a means of encouraging savings. If no tax is due, there can be no tax avoidance (by definition). Does this ad reflect a lack of tax knowledge on the part of Fidelity? Or is this a pathetic attempt to convince the public that when it comes to tax avoidance we're all in it together. Either way, Fidelity comes out looking rather foolish - as did Conservative MP John Redwood who made an ill-informed remark along similar lines in Parliament last year. Perhaps they should write out "You cannot avoid tax on a tax exempt savings account" one hundred times. They are trying to create an aassociation in the public's mind between the words "tax avoidance" and "approved by the taxman" whci means that it is therefore "OK"
So down the line when the punter reads a headline in their Money Mail or their Guardian talking about some tax avoidance by a Tory peer (or labour Peer) they will just shrug.